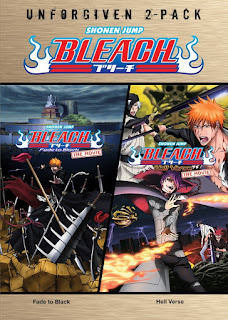 San Francisco, CA – VIZ Media, LLC (VIZ Media), the largest distributor, publisher and licensor of anime and manga in North America, offers a special treat to anime aficionados and BLEACH fans as it announces the release of the BLEACH MOVIES: THE UNFORGIVEN DOUBLE FEATURE, a special home media edition. Set for retail release on February 16th, 2016, this new DVD set contain BLEACH THE MOVIE: FADE TO BLACK as well as BLEACH THE MOVIE: HELL VERSE. The 2-disc set will carry an MSRP of $14.98 U.S. / $21.99 CAN and will feature dubbed English as well as subtitled audio tracks for both movies. Bonus features will include a production art gallery and movie trailers.